"You might want to sit down. I'm deploying." It's never easy to hear when my husband has to deploy. Especially when you have kids. 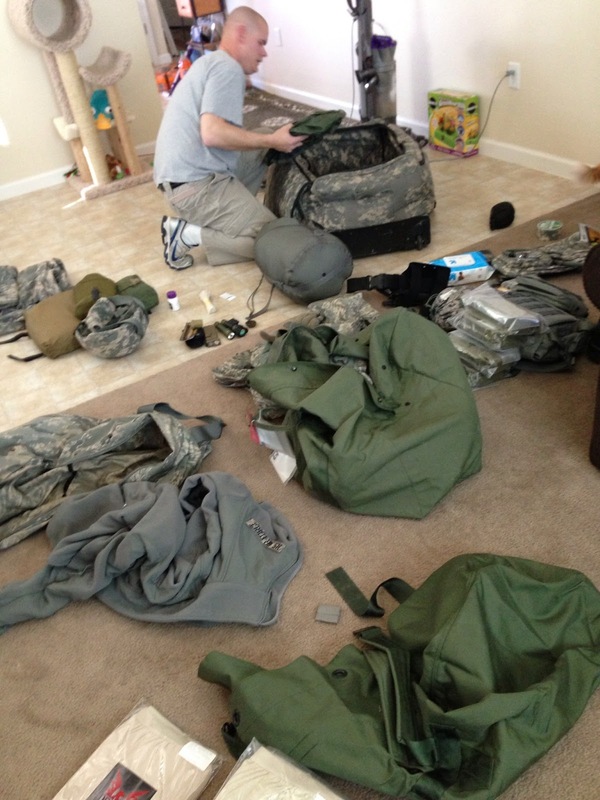 My husband has had to deploy several times, plus he did a year in Korea. There have been countless TDYs as well. My daughter was pretty young when he went to Korea and didn't fully understand why her Daddy was gone. She's a total Daddy's Girl, so there were difficult times. Sometimes she just wanted Daddy, and had complete meltdowns about it. But it is possible to parent without your spouse. And I have some tips. 1. If you have a baby and are breastfeeding, you can make life easier for yourself! You can get Tricare Breast Pumps from 1 Natural Way. 1 Natural Way has Medela, Spectra, and Kiinde brands AND they offer breast pump accessories, compression socks, and postpartum care supplies. When a spouse is gone, hormones can be all over the place, so it's great that there's a place like 1 Natural Way to help. Even better, the breast pumps are all covered by Tricare Insurance at no out of pocket expense to you! I know when my daughter was tiny, I longed for a breast pump like the ones 1 Natural Way has. 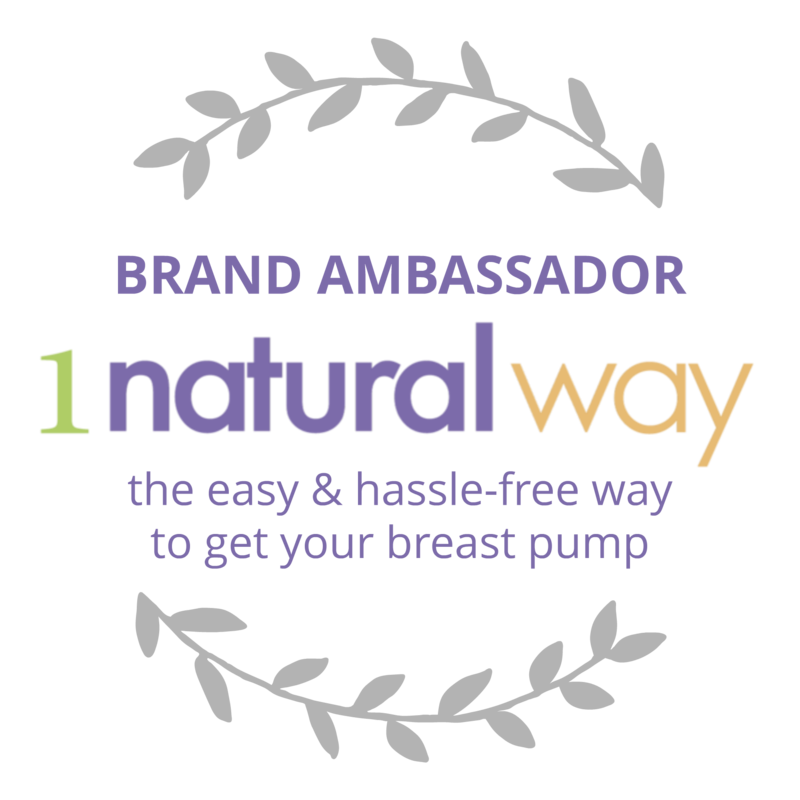 If you're interested in a breast pump, go to click over to 1 Natural Way and fill out your information. It's that simple and will take about 5 minutes. 2. Let the kids Skype with the deployed parent. We tried to do this on a daily basis. Obviously that wasn't always possible, but when it was, the kids enjoyed seeing their Daddy. Sometimes. There were times where I had to have my husband discipline the kids when they were flat out acting like possessed monsters. 4. Buy lots of chocolate. I always had plenty in the house. I know you aren't supposed to eat your feelings, but sometimes you just gotta. I didn't feel comfortable drinking since I was the solo parent, so chocolate it was. Or cans of frosting. 5. Stay consistent. If you say no, mean it. Don't give in. Yes there might be tears. But the kids need to remember that you are in charge. This was easier said than done at times, I won't lie. During tantrums, I just wanted to screech, "Fine! DON'T go to bed," but I held my ground. Has your spouse ever been away for long periods of time? I'm in my twenties and some of my batch mates are already getting married, some already have kids. I've always thought being a mom or having a family is difficult, it's just something I'm not ready for as of the movement. And I totally salute you for taking care of your daughter while your husband is away. It's probably tough taking care of a little kid alone. Btw, your daughter's eyes are veryyy pretty! These are really great and helpful for anyone who is undergoing it right now, plus chocolate always helps. Six weeks is the longest I've ever been away from my spouse and it was tough at times. At least I had my mom and dad to help out. We tend to forget the tough times the spouses have when their partner is deployed. And often times they don't have family in the area to help out. Thank you to you and your husband for all you do for our country. It must be so hard. Hopefully it goes by quickly! Life just continued on when my husband was deployed. Didn't change the routine, didn't run home to mon and dad. Life went on and we tried to keep dad in the loop as much as possible. This is so hard! I did long distance with my boyfriend for a couple of years and it was difficult, but I can't imagine it with a child! You are amazing!! It takes a special person to be married to someone in the military, that can withstand their spouse being gone for multiple periods of times throughout the year. These sound like really great tips for those parents that have to play single parent while their spouse is away. I give you props for being so strong! I don't know how I would handle being married to someone in the military! I had no idea that there was support on base for parent's. You're completely right in saying parents shouldn't feel guilty for needing a break. I can't imagine how hard it must be when a partner deploys but if must be so comforting for people to understand they aren't alone in this. My spouse isn't in the military but my nephew was deployed for 9 mos. Facetime was a life saver. Of all your tips I think the one about Asking for Help is really important. That's really important for everyone really. Allow others the opportunity to help out. Sometimes we want to do something but we just don't know what to do. Be specific and let others know what they can do to help. Watch the kids for a little while, help straighten the house, cook a meal, let others help. i do not have kids but i can see how challenging it is to be a mum! I really like your positive attitude and humorous way of managing things. I think this way things are easier and more fun too! That's really cool. Breast pumps are a must, as is. Thank you for this. I'll be sure to spread the news! I can't imagine what it is like to have a military husband, to have them deploy and not know what will happen, especially when you are a parent. My husband was never deployed, just working crazy hours, pursuing an MBA, and traveling overseas. My parents are passed and we don't have much of any family to help out ever with the kids, so it has been a challenge. The worst times were when I had a toddler and newborn and were home alone all the time, it was really rough. It must be so difficult dealing with deployment! I can online imagine how hard it must be for you and your family. Your advice will be helpful for those going through deployment as well. I will be doing this for the first time and I'm scared but I so appreciate this post. its not the same thing, but my husband traveled for work and would be gone for two weeks at a time. It was hard sometimes. I totally respect parents who have to go it alone while their spouses are deployed. I think these tips are fabulous, and I have so much respect for you! Thank you to your husband for defending our country, and our rights! It sounds like they have amazing resources available, that is big. Especially if you don't have family in the area. I remember my Uncle going to Korea for a year when I was a kid. The internet wasn't a thing yet so there was no Skyping or cell phones. These are great tips! Both of my parents were in the Navy while my sister and I were kids (although they got divorced when I was three and I was only raised by my mom from then on) and having one parent away is always hard. A well written article. Your tips on parenting will help many in similar circumstances. Your daughter is beautiful. He is an amazing man. Don't stop loving him! Serving in the military is a big sacrifice, and so with the spouse that is left behind to raise the children alone. You are a great wife and mother. It must be difficult, but you have kept it together. Hugs to you and thank you for your tips. This will be a big help to those in the same situation for the first time. I was lucky enough to be where my husband was deployed when he was still in service. But it doesn't make it any easier. These are great tips. The sacrifice that military families make to keep this country safe is amazing and very appreciated. I have a few friends and family members in the military and I know that the spouse staying home struggles a lot. These are great ideas, and lets me know ways I can be there for them more during the deployment. These are all great suggestions. I have family members in the service who use skype as often as they can. I think that really helps keep the family together. 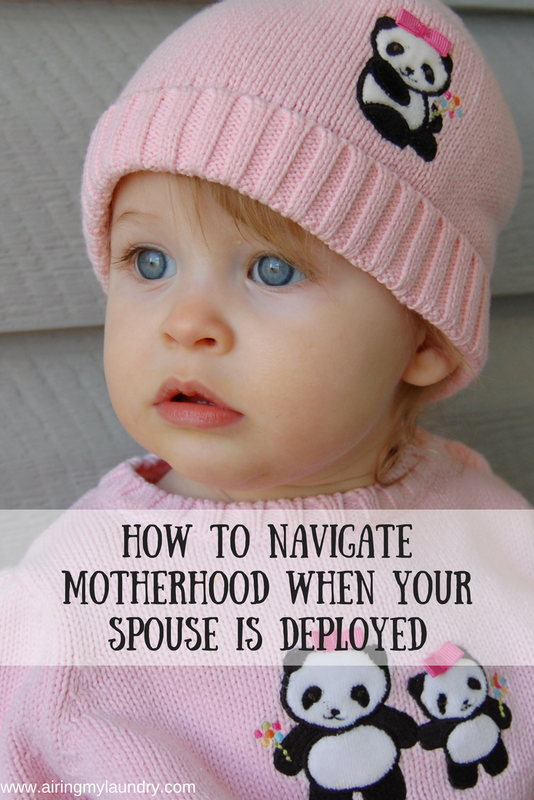 These are great tips for navigating motherhood (and life) when your spouse in deployed. I'm not married but I did have a brother deploy and that was just awful! I definitely Skyped him as often as I could! Thank you so much for your sacrifice and service as a military family. I dont have kids, but will pass this along to my military Mom friends. Chocolate cures everything! You are a great Mom and a tough one. You did a great job on taking care of your family. Kudos to you! I honestly cannot imagine what this would be like. All that I can say is that you are brave and such a strong mother and wife. Thank you for being so supportive and dedicated to your husband and thank him for his service ❤ Your tips here are wonderful though and I could see them helping with families that have a parent that travels for work a lot as well! I love what you said about accepting help. So many people don't want to while their friends and family are happy to do it. I'd be all about accepting help. You are so strong, since I have been with my husband, I don't think we have been apart for more than to days. This is great for all women with deployed spouses. Definitely a good read for inspiration. You're so strong! I feel so motivated from reading this! Your journey is amazing. I really admire your patience and strength. Yes, the deployed parent should have a skype session with the kids to eliminate home sickness.